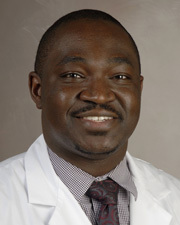 Dr. Ore-Ofe Adesina is a clinical assistant professor for the Department of Ophthalmology & Visual Science and the Department of Neurology at McGovern Medical School at UTHealth. Board-certified in ophthalmology, he has been in practice at the Robert Cizik Eye Clinic at UTHealth since 2013. He treats patients of all ages, preferably six and older, and speaks Spanish. Dr. Adesina often sees patients with problems that have not been solved elsewhere. He treats patients individually as if they were family members, taking time to find out what is going on and helping them understand their sometimes complicated conditions. As a specialist in the evaluation and treatment of patients with vision problems related to the nervous system, Dr. Adesina works in collaboration with neuroradiologists, neurosurgeons, neurologists and ear-nose-throat specialists to provide the best care to patients with neuro-ophthalmic diseases (visual, eye movement, eyelid, and pupillary disturbances arising from optic neuritis, ischemic optic neuropathy, pseudo tumor cerebri, central nervous system tumors and strokes, trauma, cranial nerve palsies causing double vision, myasthenia gravis and thyroid-related eye disease). He performs optic nerve sheath fenestrations for vision loss related to papilledema. He also specializes in surgery of the orbit and eyelids, as well as adult strabismus surgery. Outside of his practice, he enjoys soccer, basketball and watching movies.